The utility of the pressure measurement information you can gather from a SDI system is limited due to there being so few locations at which you can take measurements. If you only gather measurements at the head end or tail end of the tape lateral lines, these pressure readings should be consistent. If they are not consistent, there may be too great a loss in pressure loss along the mainlines and submains. Another possible explanation for significant pressure differences is leaking in the system. Leaks are sometimes evident during a field inspection, but they can also be missed. If you take pressure measurements at the head and tail of the tape lateral lines, the pressure distribution along the mainlines and submains (it should be nearly constant) can be determined, and the pressure losses along the length of drip tape can also be measured. By referring back to the manufacturer's technical information, you can be determine whether the pressure loss along the tape lateral is acceptable for maintaining good tape discharge uniformity. Pressure vs. discharge for a PC drip tape. Information is for Netafim DripNet PC 636 tape. So long as the operating pressure remains above a threshold value, discharge should remain constant for a pressure-compensating (PC) drip tape. In the absence of issues such as clogging, drip tape discharge should therefore be very uniform. You do need to take drip tape pressure measurements in order to ensure that the operating pressure remains above the threshold value. System locations farthest hydraulically from the water source in particular should be checked as well as any locations that significantly differ in elevation. If field-gathered tape discharge measurements are not available, you can translate pressure measurements to an estimated tape discharge rate using the manufacturer's technical information. The accompanying figure shows an example of such information for a PC drip tape. Again, it should be noted that this procedure is appropriate only if there is minimal drip tape clogging or none at all. 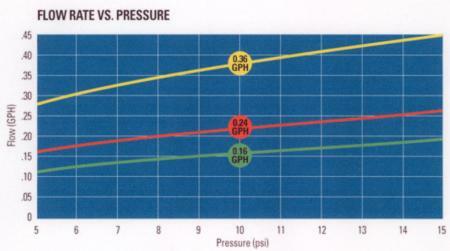 Pressure vs. discharge for a NPC drip tape. Information is for Netafim Streamline 630 series tape. The discharge rate for NPC drip tape varies with the operating pressure (see the figure). 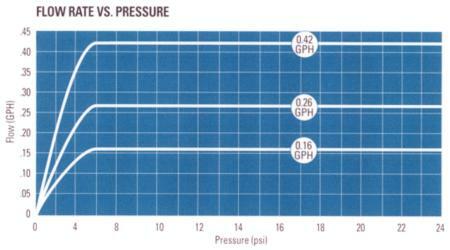 System pressure differences are therefore important since they have an impact on application uniformity. For NPC drip tapes, you can use the manufacturer's technical information to infer the discharge rate from your pressure information so long as clogging is not occurring. By this method you can derive an average discharge rate that is useful for irrigation scheduling. Additionally, you can use the discharge rate information to determine the application uniformity of the system. You can either gather discharge rate measurements directly or derive them by converting pressure measurements to discharge rates using the manufacturer's technical information. Remember that the latter method is only reasonable accurate when drip tape clogging is not an issue. Some drip tape discharge rates are given in gallons per minute per 100 feet of tape. Other tapes have small discharge emitters (e.g. 0.24 gph) spaced regularly along the length of the tape. To convert data for the regularly-spaced drip emitter style to units of gallons per minute per 100 feet, use the following formula. 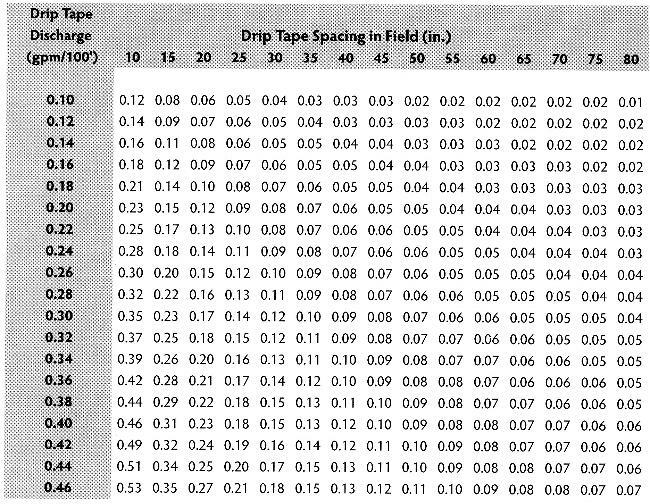 When drip tape discharge is expressed in gallons per minute per 100 feet, you can use the table below to convert the drip tape application rate to inches per hour (in/hr), a unit that is convenient for use with evapotranspiration (ET) estimates, which usually are given in inches per unit of time. You can also evaluate drip tape discharge measurements for application uniformity. This gives you a measure of how evenly water is applied to the area by the drip tape system. Greater application of water allows you to irrigate more efficiently since little extra water is required to adequately water the areas that receive the least amount of water. Discharge uniformity measures the variability of drip tape discharge rates. There are a number of terms used to quantify discharge variability, but one commonly used is distribution uniformity (DU). Emission uniformity (EU) is sometimes used to quantify microirrigation uniformity. The numerical uniformity values for EU and DU on a given system are the same. To determine the average of the low-quarter discharge rates, you rank all of the measured discharge rates from lowest to highest and average the lowest 25% of discharge rates. For example, if 40 drip tape discharge rates were measured, you would rank them from lowest to highest and then average the discharges of the 10 locations with the lowest discharge rates. That would be the average of the low quarter discharge rate. For a new microirrigation system, the following table lists the recommended EU ranges for various systems. EU is frequently used to quantify the uniformity of the microirrigation system design. Recommended ranges of design emission uniformity (EU). Due to wear on emitters, clogging, leaks, etc., the DU value for a drip tape system will likely decrease with time. Good maintenance should keep this rate of decline to a minimum. If you have previous evaluations to use as a reference for comparison, a DU decline of 5% or more from the previous number is an indicator that a problem such as clogging is occurring. A corresponding decline in average application rate would also be evidence of clogging. If this is the first evaluation of the drip tape system and the DU value is substantially below the recommended EU ranges in the table above (remember that the numerical values for EU and DU are the same for a given system), determination of the cause of the variability should be a two-step process. Examine the pressure measurements gathered during the evaluation. Significant variations in pressure within the system will cause emission discharge variability unless pressure-compensating (PC) drip tape is used. When determining how to mitigate excessive pressure variability, make sure to consult with an irrigation professional, most properly a qualified microirrigation system designer. If pressure measurements show relatively consistent operating pressure within the system, variability in drip tape discharge is likely due to clogging. For information on how to solve the problem, go to I have a clogging problem and I want to solve it.